Gott Heart Art: Skunk Day! Supplies: White Easel Card, Papers: all from my scrap box, Stamp: The Stamp Pad Co.-Skunk Birthday K-137, Ink: Momento-Tuxedo Black, Stampin Up-Pacific Point, Copic markers, VersaMark Ink Pad, Stampin Up clear embossing powder, Stampin Up-Sizzix Embosslits Beautiful Wings, Stampin Up-Modern Label punch, Wal-Mart-Daisy Buttons, craft wire, lg. flower brads, glue dots, pop dots. Wow, Beverly, you sure Piled it On quickly today. 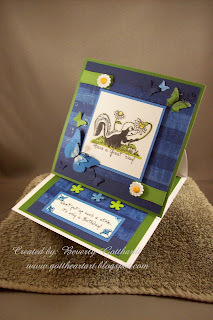 I love your little stinker card - great colors and cute image! So happy to see you joining in the fun with us this week at Pile it On! Hi Beverly, So glad to run across you again. Your card for FlutterBy is just adorable. Thanks for joining us. Ah, lovely card. Thanks for joining in this week at Polkadoodles. Wow, way to pile on those challenges! This is awesome!! Love that little skunk and of course, those butterflies. Thanks for joining us at Flutter By Wed this week! Luv' the colors, they are just so nice and vibrant and the skunk... well lets say is stinking cute... LOL!!! Love your card Beverley the colour combo is fab and your choice of image is very unusual, great fun. Thanks for playing along at Magical Crafts. Whata fabulous card Beverly, love the blue and green colours together. Totally cute! Love all the butterflies surrounding your little skunk! Beautiful easel card! Fun card!! Love it!Thanks for playing along with my flutter by challenge! Wow, I love your card. Great colours, its really so cute. Thank you for taking part in the Paperplay challenge this week. Lovely card. Thanks for taking part in the Polka Doodle challenge. super cute, thanks so much for playing along with PIO. Great job Beverly! Thanks for piling it on with us! Just LOVE that little skunk! Gorgeous card, and thanks for playing along at Magical Crafts. Very cute card, Beverly - that little skunk image is gorgeous. Just too "stinkin' cute"! Thank you so much playing along with us at the Polkadoodle Challenge this week. Lovely colours! Thanks for entering the Polkadoodle Challenge - hope you can join us again next week!